MSc. Strategic Communication and Public Relations. School of Arts and Humanities. Download "MSc. Strategic Communication and Public Relations. School of Arts and Humanities. 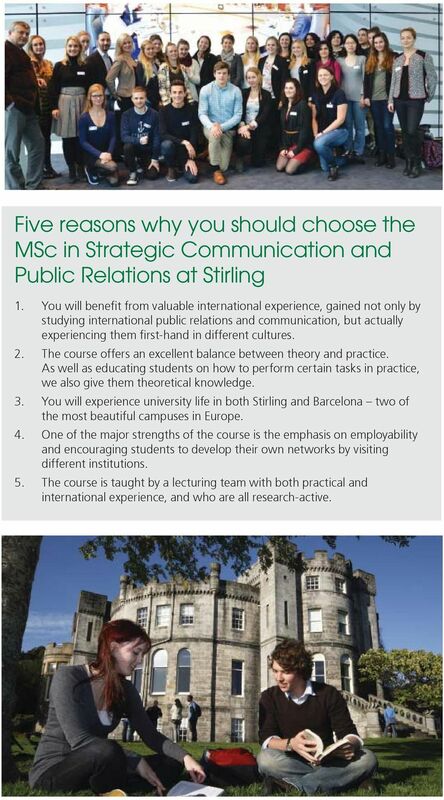 http://stir.ac.uk/in"
4 Five reasons why you should choose the MSc in Strategic Communication and Public Relations at Stirling 1. You will benefit from valuable international experience, gained not only by studying international public relations and communication, but actually experiencing them first-hand in different cultures. 2. The course offers an excellent balance between theory and practice. As well as educating students on how to perform certain tasks in practice, we also give them theoretical knowledge. 3. 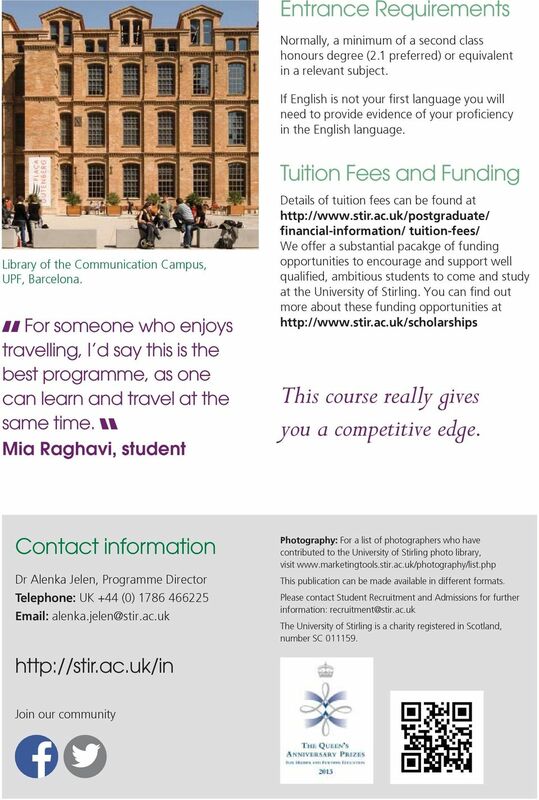 You will experience university life in both Stirling and Barcelona two of the most beautiful campuses in Europe. 4. One of the major strengths of the course is the emphasis on employability and encouraging students to develop their own networks by visiting different institutions. 5. The course is taught by a lecturing team with both practical and international experience, and who are all research-active. 5 Programme Overview Timetable: The mode of study is full-time for one year. 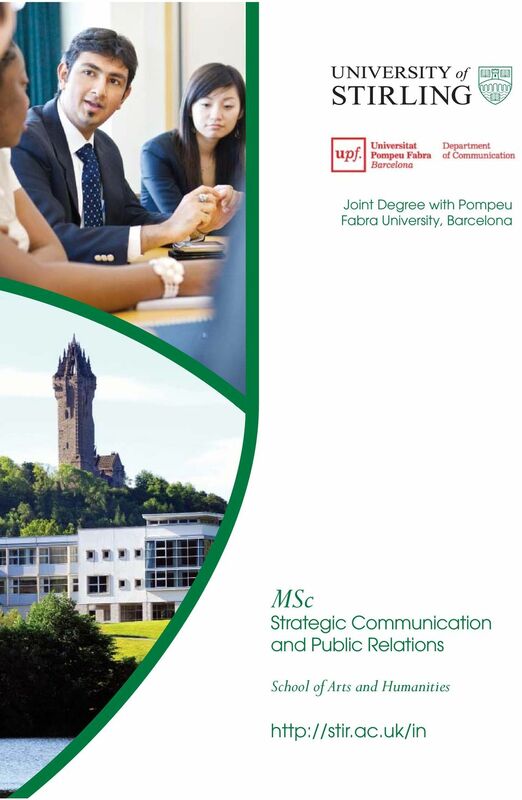 Students spend the first semester at the University of Stirling and then move to Pompeu Fabra University for the second semester. Students then decide if they would like to have their dissertation supervised by Stirling or Pompeu Fabra. 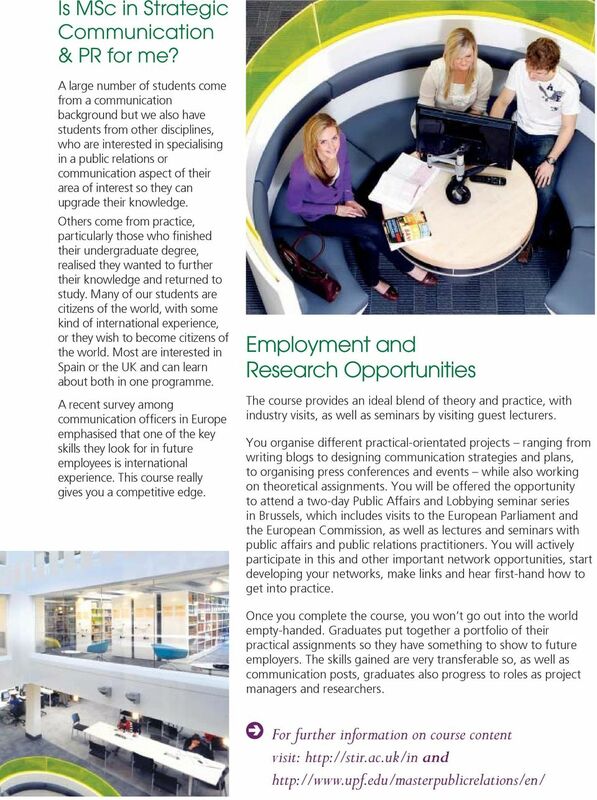 Modules: Semester 1 is taught in the top-rated division of Communications, Media and Culture at the University of Stirling and comprises modules in Public Relations and Public Communications Theories, Media Relations and Production and Research for Dissertation/ Research Design. 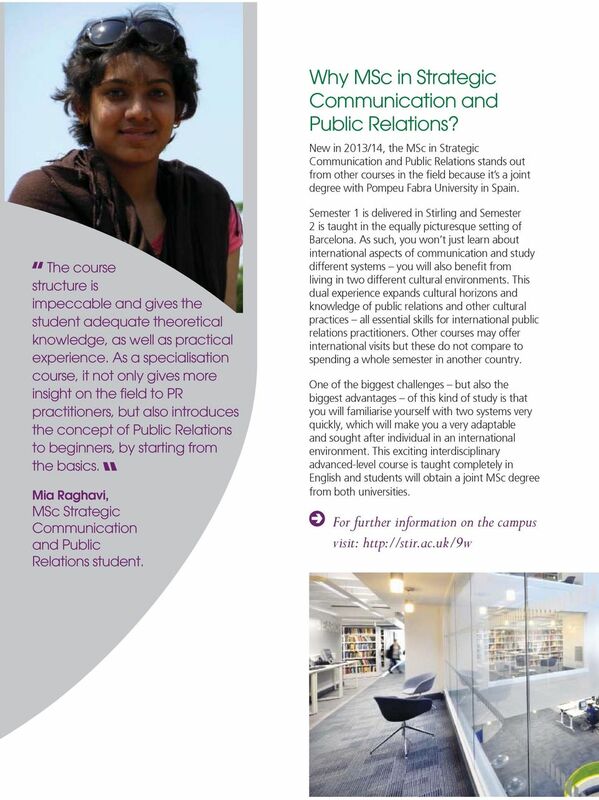 Modules studied in Semester 2 at the Faculty of Communication at Pompeu Fabra University, featuring prominently in international rankings, are Strategic Public Relations Planning, Research and Evaluation for Practice, Public Affairs and Advocacy, Public Diplomacy and Strategic Communication and Public Relations and Digital Media. Dissertation: A project lasting approximately three months, the dissertation is 12,000 words and students choose whether to be supervised in Scotland or Spain. Key staff: The course director is Dr Alenka Jelen, who joined the University of Stirling in September 2013, and who brings international expertise to the course through both study and teaching posts at the University of Ljubljana in her native Slovenia and the University of Central Lancashire in Preston. Her own Master s degree was a joint degree between the University of Central Lancashire and Hogeschool Utrecht in the Netherlands, so she, herself, boasts firsthand experience of studying in two different countries in one year. As well as impressive academic credentials, including a PhD in the field of Social Sciences-Communication, Dr Jelen also has public relations experience and a strong background in broadcast journalism. The programme director in Barcelona is Frederic Guerrero-Solé, PhD in Public Communication. His main research focus are sociology of communication, media effects and social networks. He has published his works on the thirdperson effect and on politics and Twitter in Information, Communication and Society and in Communications: The European Journal of Communication Research, between others. He is a Bachelor in Theoretical Physics and in Slavic Philology. He teaches Sociology of Communication, Quantitative Research Methods for Communication and Public Relations, and Intercultural Communication at the Pompeu Fabra University. He has worked and done research in Brussels (Ingram Micro), Paris (EADS), Tallinn, Saint Petersburg and Manchester. Management School MSc/PG Dip/PG Cert MSc Business and Management University of Stirling Management School I am passionate about helping our students to excel and achieve whatever they wish in their careers.